An external eyelid stye, or hordeolum externum, is a red, painful bump that appears on the outside of the eyelid. It typically resembles a pimple, can cause some light sensitivity, and can be a concern if you’ve never had one before. Thankfully, there are a number of home remedies for a stye, so you can say goodbye to the stye on your eye without too much hassle. External eyelid styes typically appear near a corner. Along with being marked by a red growth and discomfort around the eye, it may also result in watery fluid in and around the eye, and may last for several days before healing. There are a couple of different ways a stye can appear on your eyelid, but each is the result of an infection. Clogged oil glands: Cogged oil glands are the most common cause of eye styes. Your eyelids have a number of oil glands that are responsible for making sure the area stays lubricated. These glands also help to create tears to remove unwanted intruders, but sometimes they can be blocked by old oil, dead skin cells, dirt, or bacteria. Rubbing the area after contacting an infected surface: Most of the time, styes are a result of a Staphylococcus infection. Staphylococcus is a bacteria commonly present in the eye, but it can get trapped and result in an infection. If you share makeup that’s been infected or touch another surface that’s been infected and then touch your eye, a stye may appear within a few days. Chronic inflammation: People with a chronic inflammatory eye conditions, like blepharitis, may see stye flare-ups. Can a Stye or Hordeolum Spread from one Eye to the Other? Are Styes Contagious? Yes and no. If you have a stye on your left eyelid, the infection will not spread to the right eye on its own. However, if you rub the stye or even the affected eyelid, then touch your other eye, the bacteria can be transferred and it might result in a stye on the other eyelid; but it’s also possible that no stye will appear. However, rubbing the stye could cause the infection to spread to other parts of the eye. You can limit the risk of hordeolum externum spreading from one eye to the other by washing your hands regularly, while avoiding touching or squeezing the stye. So, is a stye or hordeolum externum contagious or spreadable? No, but the bacteria causing it is. How Long Does it Take for a Stye or Hordeolum to Go Away? Once a stye appears, it can take up to two weeks to clear up, but will typically go away in several days. Of course, hordeolum treatments can help relieve symptoms and remove it from your face in just a few days. One such treatment that can be effective is applying a warm compress for 10 to 15 minutes per day, upwards of five times per day. Even if you choose not to treat your stye, there are no significant health risks. For the most part, it’s recommended to get rid of styes as soon as possible for esthetic reasons and for any discomfort they might cause. You might be compelled to pop it, like you would a pimple—but don’t. This is not a good way to get rid of a stye and will cause more problems than it solves. How Is a Stye or Hordeolum Diagnosed? If you see a red bubble appearing on your eyelid, or if the area becomes sensitive, or you feel a scratching sensation on you eyeball, it’s likely a stye. Although you don’t necessary need the diagnosis of a medical professional, feel free to consult your doctor. Most of the time little more than a visual confirmation is required, but sometimes the doctor may take a sample to see what kind of bacteria caused the stye. This is non-invasive and can be done by rubbing a swab on the affected area. The doctor may prescribe an antibiotic cream, but it may not be required, as there are a number of natural hordeolum externum treatments available. There are a variety of ways you can treat hordeolum externum naturally from the comfort of your home. Shrink your eyelid pimples by using the following treatments. Take a clean cloth and wet it with warm water. Ring it out to squeeze away the excess water and press it to the affected eye for 10 to 15 minutes, three to five times per day. The compress should help to drain liquid from the bump. Be sure to clean the cloth afterwards to prevent further infection. Mix a teaspoon of turmeric into a glass of water or milk and place it on a gauze or cloth. Apply it to the eye for 10 to 15 minutes a few times a day. Milk seems to work best. In fact, there are some reports indicating that taping a gauze to your eye overnight with this mixture can greatly reduce the size and swelling of a stye. You can also try drinking the mixture, but a direct application will likely be more effective. Instead of using a cloth with water, you can use warm green tea bags. Green tea has antibacterial properties that can reduce the swelling of a stye and promote timely healing. Take a handful of parsley and brew it in some boiling water for about 10 minutes. Close the eye, dip a clean cloth into the water and apply it to the affected eyelid. Lay back and relax for 15 minutes as the purification agents in the parsley help remove bacteria from the stye. Cleaning your eyelids with tear-free baby shampoo can also help relieve the irritation and appearance of a stye. Simply mix some shampoo with warm water and wipe it on your eyelids with a cotton ball or clean cloth. Repeating this every day or two should help. Garlic is rich in antioxidants and antibacterial properties that can be used to heal a stye. Apply it to the affected area once or twice per day, but make sure to water it down. Rich in ricinoleic acid, castor oil can be used as an anti-inflammatory to treat hordeolum externum. What Are the Possible Complications of Hordeolum? Complications are very rare, but they can occur in a very small number of cases. A persistent stye can result onto a Meibomian cyst if the gland is completely blocked for a long period of time. Thankfully, these cysts, which are more severe than a regular stye, are still very easily treatable. It’s also possible that the infection can spread to the tissue around the eye. This is called preseptal cellulitis. When this happens, the skin around the eye can become red and inflamed. This can also be easily treated with antibiotics. There are a few preventative measures you can take to reduce the chances of getting a stye. Wash your hands. Since most bacterial infections are spread by touching, washing your hands regularly is the best way to ensure your eyes don’t get infected. Throw away old makeup. 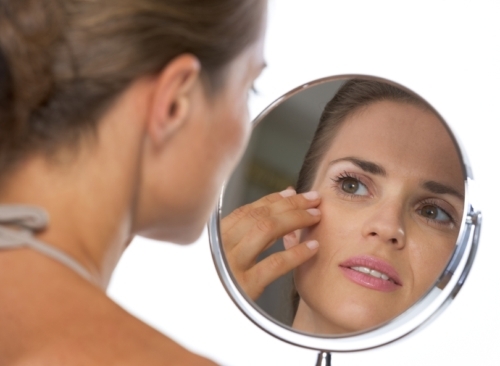 Mascara, eye shadow, eyeliner and other makeup used around the eye can increase the risk of a stye. If it’s older than three months, it’s probably wise to get rid of it. Also, wash brushes and other applicators regularly. Rinse your eyes daily with warm water. Remove and disinfect contact lenses daily. Take makeup off before bed. Dock, E., “External Eyelid Stye (Hordeolum Externum)” Healthline web site, January 28, 2016; http://www.healthline.com/health/stye#Overview1, last accessed March 15, 2016. Nordqvist, C., “What Is a Stye? What Is Hordeolum?” Medical News Today web site, March 29, 2011; http://www.medicalnewstoday.com/articles/220551.php, last accessed March 15, 2016. “Stye Remedies,” Earth Clinic web site, March 1, 2016; http://www.earthclinic.com/cures/sty3.html, last accessed March 15, 2016. “Top Remedies for Eye Sty,” Top 10 Home Remedies web site, 2014; http://www.top10homeremedies.com/home-remedies/home-remedies-eye-sty-stye.html, last accessed March 15, 2016. “Top Remedies for Eye Sty,” Top 10 Home Remedies web site, 2014; http://www.top10homeremedies.com/home-remedies/home-remedies-eye-sty-stye.html/2, last accessed March 15, 2016.